I have been dealing with red skin welts since I was 12 and now I am 22. When I was little I had been to dermatologists and they told me that I just have sensitive skin and that I should use products with gentle action. I followed their advice but there was no use. Nobody could tell me that in fact I had dermographism. One night I was doing some research on the internet and I found an article about this skin condition. Thank god for the internet! The red skin welts appear when I unknowing scratch myself and even when somebody touches me a little harder. It's really frustrating and embarrassing, especially when it happens in public and to make it worse it is aggravated with heat. I have never been allergic to anything in my life and never had other problems with my skin. It seems I have to live with this the rest of my life and I hate it that I don't even know the cause. About two years ago I noticed a few red skin welts on my back. I didn't think too much about it but then they became more frequent and they would be tender or sometimes itch. It took a while for me to figure out what was causing it. I was 33 years old and had never experienced it before. Finally, I noticed the red welts would always seem to develop where I had been leaning against something or had pressure applied to that area. Being in the Army, there are about a million things that your body gets pressed against. I have been worried to see a medic about it because I am not sure if I would get discharged for the skin condition. I love my job and would like to serve my country for as long as I physically can. So far, there has been no medication that seems to work. I have tried allergy pills, and although they seemed to work initially, lately they have done nothing to sooth the discomfort. I think I may have this red skin welts condition, but I'm not 100% sure yet. I started itching over the weekend, getting what I thought were rashes/hives. For three days now, I have been taking Benadryl to keep the itching at bay. When I got in to work today I started looking online at "hives" and "rashes". I came across the word "dermographia" in one of my searches and started reading up on that. To test myself, I lightly raked a fingernail down my arm. Within minutes I got red skin welts. So now I think I am sure that is what it is, I just don't know why it is happening. The welts lasted about one to one and a half hours. I also lightly traced my name into my arm with my nail, which now is welted up as well, but was kind of funny to me having red welts that say "Chris"!! I am going to the doctor today and I hope whatever is causing this will go away! I have been experiencing extremely irritating and embarrassing raised hives for about a year. The first time I got them I went and showed my mom and she was devastated. She thought I had been recently whipped. When I get my skin hives they appear as extremely long red skin welts and it almost looks as if I have indeed been whipped by a skipping rope. These hives or welts come and go all the time and sometimes at extremely embarrassing times. This causes me to have low confidence. I do not know what to do. I cannot stop the scratching and the burning sensation. I worry sometimes that I might have some sort of skin cancer. Today is my first day looking for a cure for this red skin welts problem and I don't plan to stop until I find one! About four months ago I was working around the house and using a lot of pressure on my hands. My hands started to get very itchy and red welts started going up my hands to about four inches above my wrists. I didn't know what it was and it was getting worse. At four am my wife had to drive me to the hospital. They gave my Benadryl and Prednisone. The swelling started to go down and they sent me home. In the last four months, I have skin welts break out with itching about every two or three days. I was tested for food allergies and found that I was alright. Then I went to a very good doctor. He took one look at my welts, made a big letter H on my back and told me that I had skin writing disease. I take Benadryl when it gets too bad, but at 71 years old, I can live with it. I hope that my dermographism story can help someone else who has this skin condition and does not know what it is. I am just glad to know what I have. This link provides options for a natural hives treatment. 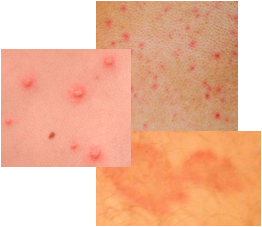 Visit the dermatographism - red skin welts and other symptoms page for more information.